In Windows Server 2012, you can convert a computer installed with the full GUI option to Server Core, and vice- versa. This is a major improvement in Server Core version present in Windows Server 2008 R2, in which you can only re install the operating system to switch from GUI-Core and Core-GUI.With this capability, administrators can install servers with the full GUI, use the graphical tools to perform the initial setup, and then convert them to Server Core to conserve system resources. Later if they want they can again change the server back to Full GUI. 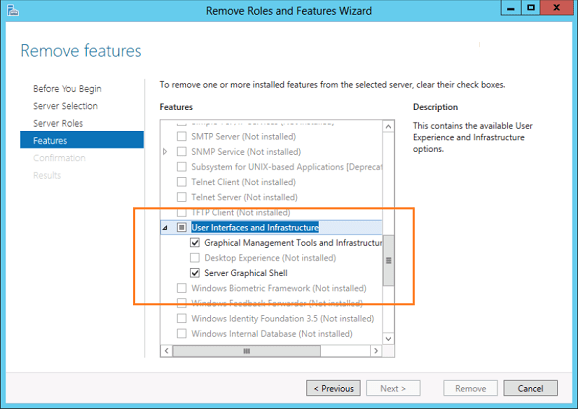 To Convert a Full GUI Windows Server 2012 to Core Edition we need to remove the following features under “User Interfaces and Infrastructure” in Server Manager’s Remove Features Page. An easy way to automate this task via power shell is to use the following commands. To Convert a Full GUI Windows Server 2012 server to Server Core use the following Powershell command. To Convert a Server Core Mode Windows Server 2012 server to Full GUI use the following Powershell command.